Believe it or not! The National Security Council (NSC) recently considered a proposal by a top Defence Ministry official to impose a ban on Muslim women in Sri Lanka wearing the burqa or niqab. The burqa is the full body dress, usually black, with a mesh cover over the eyes. This is worn by some more traditionally minded Muslim women. The niqab is similar with only an opening over the eye area. The MoD official’s proposal, a well informed source said, was based on the recommendations by a controversial top sleuth running one of the country’s intelligence agencies of a service arm. The person has been serving in that top position under the previous Government, too. The top sleuth had made the recommendation in the belief that radicalisation in the Muslim community has gone beyond control — a point he has been articulating at different security meetings. The MoD official’s proposal to the NSC came thereafter. It was Prime Minister Ranil Wickremesinghe who frowned on the proposal and pointed out that it would be highly damaging to the Government. He was of the view that Muslims supported the United National Front (UNF) alliance both at the presidential and parliamentary elections last year. The proposal was thereafter dropped. The MoD official’s proposal at the NSC came soon after the Army, Navy and the Air Force commanders made presentations on the current security situation. There are no records at different security forces headquarters or with the police that women wearing burqa or niqab have been involved or been identified engaging in terrorism related acts in Sri Lanka. The only exception had been a man wearing a burqa attempting to rob a bank. He was found out and the man’s true identity was never made public. Among the countries that have banned women wearing full body covering is Switzerland where a fine of 10,000 euros is imposed on violators. France, the first country to ban Niqab in 2004 with school students in state run schools later in 2011 extended it with a public ban countrywide. The Netherlands has imposed a partial ban where women cannot have their faces covered in schools, hospitals and on public transport. It does not outlaw the veil in public but has laid down essential areas where persons have to be seen due to security reasons. In Chad, in parts of Diffa, where the radicalised Boko Haram is in control, the full cover garb is banned for fear of attacks. Germany is at present considering a limited ban. Even in the United States and Britain, which are facing serious threats from the ISIS, there has so far been no ban on women wearing the burqa or the niqab. Saroja Wijeratne, Consul General in Mumbai, has been named as Sri Lanka’s Ambassador to Germany. Her name has already been proposed to the German Government and the agremont (concurrence) is being awaited. Ambassador Karunatilleke Amunugama, whose term has already ended, has been told to continue in office until Ms. Wijeratne arrives in Berlin. Civil society groups have sought a meeting with President Maithripala Sirisena. This time it is to ascertain why the alleged corruption cases of a group of officials have not been investigated. They are accusing a politician of stalling these investigations and want President Sirisena to look into the matter. “The above article states that the Pan Asia Bank transferred the mentioned amount on 11th August two days before the government announced the seizure of those funds. Note by Jamis Banda: His “clarifications” (sic) is indeed confirmation of our report. It further establishes the truth that the money was transferred two days ahead of a purported decision by the Cabinet of Ministers – a position which was announced by the official Government spokesperson. As for the reference to a Court order, there was no mention in our report. The bank is now adding the fact that it is consequent to a Court order. Naturally, no bank would voluntarily remit such amounts belonging to its customers to the Central Bank without a legal basis. 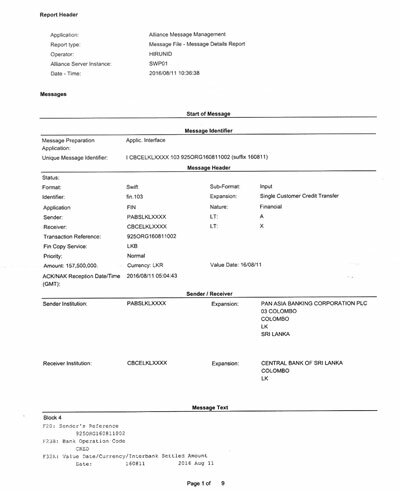 For those who need more proof, here is a facsimile of the official document containing the remittance information: As is clear, the remittance has been made at 4.43 p.m. on August 8, 2016. As for the name and address of the “Ordering Customer,” we will not name them yet. Three former Sri Lanka envoys have been appointed as inspectors in the Ministry of Foreign Affairs. They are Daneeshan Casiechetty, Geetha de Silva and G. Wijesiri. The move by Foreign Affairs Minister Mangala Samaraweera is for these officers to conduct investigations on different issues in Sri Lanka diplomatic missions overseas. A Foreign Ministry official said that complaints of mismanagement, malpractices or other irregularities in Sri Lanka diplomatic missions would be referred for a probe by one of the three. They, one or more, will be required to travel to those missions to conduct inquiries. Mass Media and Parliamentary Reforms Minister Gayantha Karunatilleke has recommended to the Cabinet of Ministers that the mobile telephone allowance for MPs be increased to Rs. 50,000 a month. In addition, he has recommended that the office Secretary General of Parliament should pay the land line telephone bills of MPs. The proposals are contained in a memorandum submitted to the ministers by Mr. Karunatilleke. In his observations, Finance Minister Ravi Karunanayake has noted that the average cost of allowances of a mobile phone and a fixed telephone of an MP was about Rs. 16,000 a month. He has pointed out that an MP is entitled to a maximum of Rs. 20,000 a month for both land and mobile phones, according to a circular by the Presidential Secretary.